“It was his newsletter, and it was under his name, so he always got to see the final product. .?.?. He would proof it,” said Renae Hathway, a former secretary in Paul’s company and a supporter of the Texas congressman. His newsletter. His name. Proofed. Oh yeah. Great copy. Shrewd business. But he didn’t believe that stuff. Look, maybe Nick Gillespie is right: perhaps all this really shows is that pobody’s nerfect, and…hey look over there — NAACP President Ben Jealous, one of Ron Paul’s innumerable BLACK FRIENDS! !1 But Paul built his vast political capital by cementing in the public consciousness an unshakable image of consistency, honesty, and, above all, conviction. The newsletters dissolve that fiction. 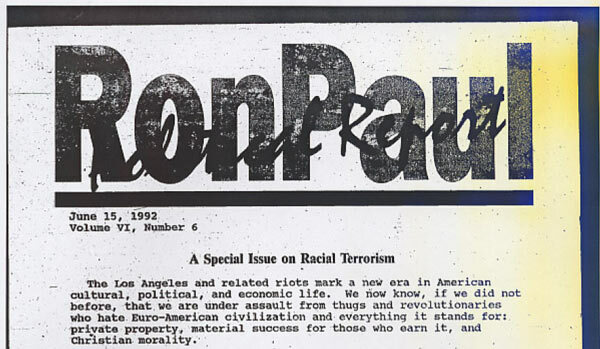 If Paul was willing to pimp white nationalist pr0n to Willis Carto’s debased, cash-happy fanbase when it was financially lucrative and politically feasible to do so, what won’t he say or do to make a goddamn dollar? Ask yourself that the next time the rEVOLution drops a money bomb.